Thu., Dec. 22, 2016, 4:34 p.m.
Washington’s 1977 “faithless elector” law requires persons serving on the Electoral College for the state to sign a pledge to cast their ballot for the winner of the state’s popular vote. 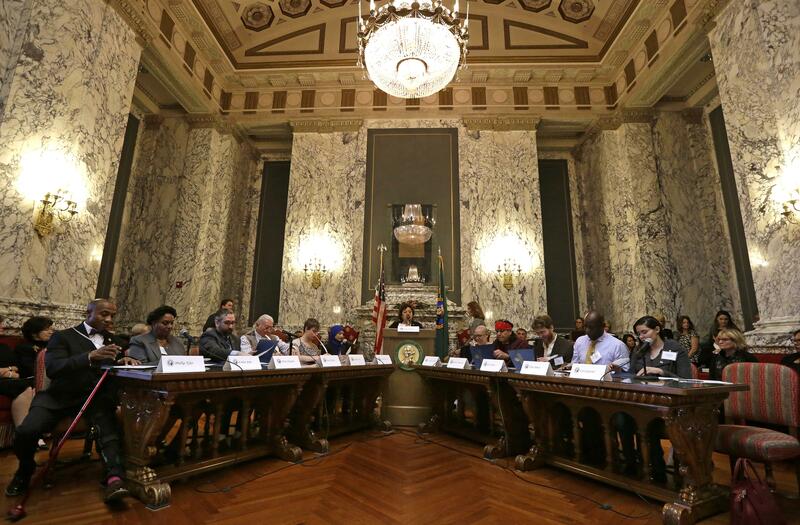 OLYMPIA – Washington’s four “faithless” electors face a $1,000 fine each for not voting for Hillary Clinton when the Electoral College met Monday, state elections officials said. Three voted for retired Gen. Colin Powell and one voted for Native American activist Faith Spotted Eagle. Washington has a law that requires electors, who are chosen by the state’s political parties, to cast their Electoral College ballots for the person who wins the state’s popular vote. Failure to do so can result in a fine as high as $1,000. The secretary of state’s office said it will send each a notice next week of the $1,000 fine, with payment due in 60 days. The electors will be given a chance to appeal, although the exact details of that process haven’t been set. At least two who voted for Powell were part of a group that called themselves “Hamilton electors,” an effort to force the presidential election into the House of Representatives, and deny Donald Trump from taking office, by persuading Republican electors in other states to cast their votes for someone other than Trump. But the movement needed at least 37 Republican electors from around the country, in states where Trump won a majority of the popular vote, to break ranks and vote for someone else. As of Monday, when the Electoral College met, the group hadn’t settled on a compromise candidate, and in states carried by Trump only two electors in Texas went for someone other than Trump. Because Texas electors cast secret ballots, it’s not clear whether they were Hamilton electors, or just expressing support for Ohio Gov. John Kasich and former U.S. Rep. Ron Paul, who each got one vote in that state. In Washington, where the popular vote went to Clinton, the strategy only served to subtract from her total. Robert Satiacum, the Washington elector who voted for Spotted Eagle, wasn’t part of the Hamilton elector strategy. He had spent time at the protest against the Dakota Access oil pipeline at Standing Rock, where Spotted Eagle is a leader in the demonstration, and said he was voting for her as someone who would understand the need to protect the nation’s land and water. This will be the first time the law, enacted in 1977, is applied to a faithless elector. It was passed after the last elector to deviate from the state’s popular vote, Mike Padden, voted for Ronald Reagan rather than Gerald Ford in 1976. There was no penalty on the books at that time. Padden is currently a state senator representing Spokane Valley. The Hamilton electors challenged the law in federal court before the Electoral College met, but a trial judge refused to grant a restraining order because they couldn’t show harm unless the state applied it. The 9th U.S. Circuit Court of Appeals agreed. Now that the fine is being levied, the challenge is likely to return to federal court, where the Washington attorney general’s office will be defending it. Published: Dec. 22, 2016, 4:34 p.m.